ATLANTA, March 3, 2017 /PRNewswire/ -- More than 2,500 teen leaders from around the country convened in Chicago this week for Boys & Girls Clubs of America's 50th annual Keystone Conference presented by Aaron's, Inc. (NYSE: AAN) a leading omnichannel provider of lease-purchase solutions, and its divisions Aaron's and Progressive Leasing. This morning, teens participated in a session on community policing featuring Grammy and Oscar winner Common, learning how to engage in conversations that help bridge relationships between teens and law enforcement. The conference kicked-off earlier this week with a newly renovated teen center at the Miguel A. Barreto Union League Boys & Girls Club in Chicago thanks to national partner Aaron's. 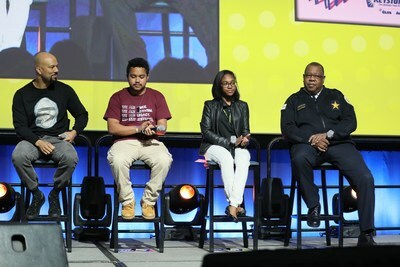 (L to R) Grammy and Oscar winner Common, Houston Keystone Teen Kivin Gant; Washington, D.C. Keystone Teen Erikah Moore; and Chicago Police Department Deputy Chief of Community Relations Eric Washington led a discussion with 2,500 teens attending the Keystone Conference, sponsored by Boys & Girls Clubs of America and Aaron's, Inc., and share ideas on how teens can engage in meaningful conversations with local leaders including law enforcement officials. More than 2,500 teen leaders from around the country convened in Chicago this week for Boys & Girls Clubs of America's 50th annual Keystone Conference presented by Aaron's, Inc. 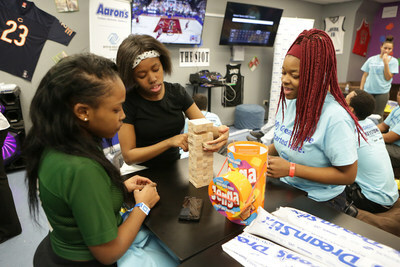 The conference kicked-off earlier this week with a newly renovated teen center at the Miguel A. Barreto Union League Boys & Girls Club in Chicago. This year's conference theme, "Activate Your Legacy," inspires teens to develop leadership skills as ambassadors in their Clubs and communities. The theme of this year's conference is "Activate Your Legacy," showing teens how they can develop and enhance leadership skills enabling participants to be leaders and ambassadors in their Clubs and communities. The first Keystone conference, in 1967, also took place in Chicago. "Each day, Boys & Girls Clubs around the country inspire and empower teens to elevate their voice and activate their legacy to build a great future," said Jim Clark, president and CEO of Boys & Girls Clubs of America. "Thanks to the support of partners like Aaron's, thousands of teens will realize opportunities to lead and make a difference in their Clubs and communities through the Keystone Club. The 50th anniversary of the Keystone Conference is a celebration of our incredible teens and the legacy of millions of Club alumni who have found their voice through their Boys & Girls Club." The Miguel A. Barreto remodel was the 18th renovation made possible through a partnership with Boys & Girls Clubs of America and Aaron's. With input from the teen members, Aaron's associates and Club officials worked Monday painting, decorating and furnishing a study, games and lounge area the Club. On Wednesday, local Aaron's associates and Club officials unveiled the new space, which is now equipped with new technology, sectionals, tables and chairs, sound systems and fresh coats of paint. "For five decades, Keystone, Boys & Girls Club of America's premier teen leadership program has transformed the lives of youth across our country, and Aaron's is honored to help make a difference in these teens' lives," said John Robinson, CEO of Aaron's, Inc. "The 50th Annual Keystone Conference is a shining example of how young people can learn to be leaders and affect social change even at their young age. Aaron's is grateful to help America's teens realize their potential by investing in this instrumental program." To see photos of the Keystone Club remodel and the 50th Keystone Conference, visit Boys & Girls Clubs of America's Facebook page (www.facebook.com/bgca) or Aaron's on Facebook (www.facebook.com/aaronsinc), on Twitter (www.twitter.com/AaronsInc) and at www.AaronsGives.com. For more than 150 years, Boys & Girls Clubs of America (GreatFutures.org) has enabled young people most in need to achieve great futures as productive, caring, responsible citizens. Today, more than 4,300 Clubs serve nearly 4 million young people through Club membership and community outreach. Clubs are located in cities, towns, public housing and on Native lands throughout the country, and serve military families in BGCA-affiliated Youth Centers on U.S. military installations worldwide. They provide a safe place, caring adult mentors, fun and friendship, and high-impact youth development programs on a daily basis during critical non-school hours. Club programs promote academic success, good character and citizenship, and healthy lifestyles. In a Harris Survey of alumni, 54 percent said the Club saved their lives. National headquarters are located in Atlanta. Learn more at www.facebook.com/bgca.clubs and https://twitter.com/BGCA_Clubs.